Simply share an proper extract of your calendars. Calex helps you managing your corporate time. and let Calex combine them to one single sheet. 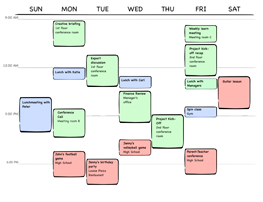 Simplify arrangements of appointments by export your temporal disposability or even all your calendars for a specific period of time and share it with colleagues, co-workers, business partners or even family and friends. ... and let them see your disposability. 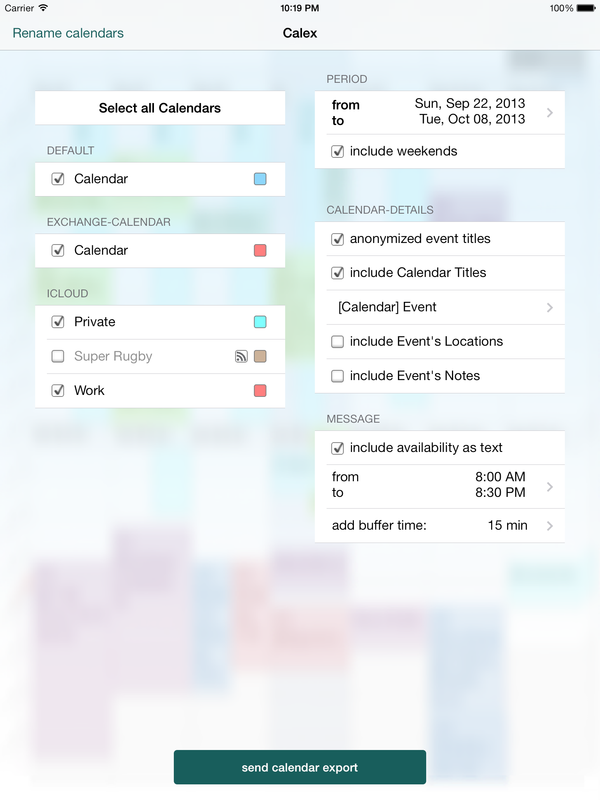 Select all the calendars you want to share events from. 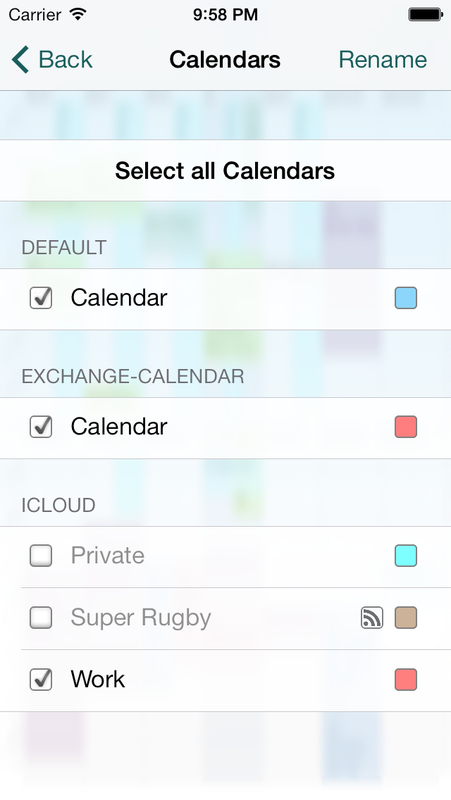 Include any calendar connected to your device from various sources - like iCloud, Local, Google Calendar and MS Exchange. 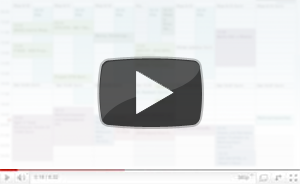 Select the days you want to export using the calendar date picker. You may only include weekends if needed. 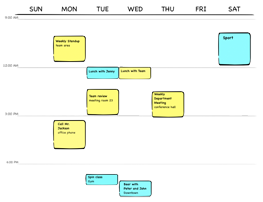 Do not worry about giving too much insights by selecting the right amount of details for calendar exports. 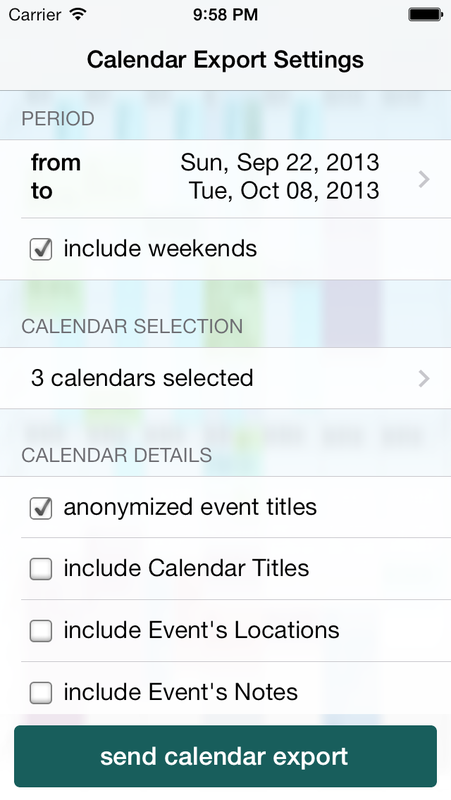 In order to keep the context of your exported events, append the calendar name to the event's titles. There are different formats to choose from. It is even possible to rename the calendars by setting aliases. E.g. 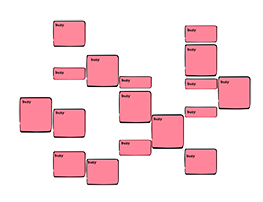 to abstract several calendars into one single context. Share right from inside the app via Email, Messages or Airdrop has using all the native sharing options OS X and iOS offer. With the latest version you can even include your temporal availability as text included in the automatically generated messages for sharing. Simply export .ics files and proceed with your personal workflow. E.g. export all your iCloud calendars onto your iPod Nano, which is not provided by iTunes syncing. Open the ics calendar file by double clicking it. In the Calendar Apps Window select "New Calendar"
Open the Menu next to "Other calendars"
Choose "Import from an iCalendar (ics) or vCalendar (vcs) File"
You can also import the ics file into your primary calendar clicking [Import]. However, I recommend using this option so you can easily get rid of all importet events by deleting the entire calender which will be created. 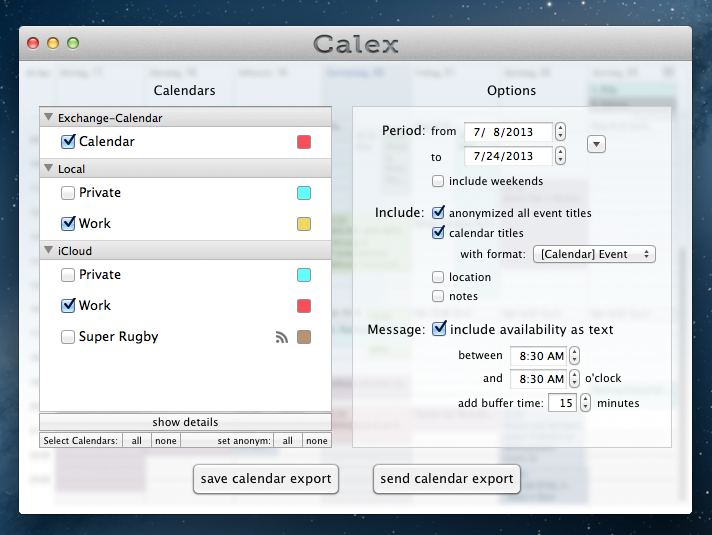 Calex did and will come with updates for various more features and enhancements to share calendar snapshots. If you have any ideas or request in addition, feel free to drop me a line. Include human readable text export in your mails. [Mac OS X] Export your calendas as csv file. [Mac OS X] Automatically sequential export your calendar to your server in order to provide it for subscription.